If these standings hold, that would be a MLB record. The record for most starters from one team is the Yankees in the 1939 game, but that was also held at Yankee Stadium. Of course, there was one instance of seven players being elected to the game, the 1957 contest, where seven Reds were put into the National League lineup but two outfielders, Gus Bell and Wally Post, were removed from the lineup in favor of Hank Aaron and Willie Mays due to an incredible amount of ballot-stuffing from Cincinnati fans. 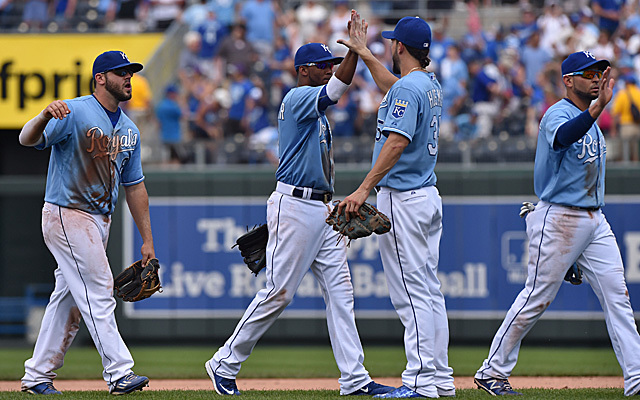 The Royals are the defending American League champions and have had a tremendous season to this point, sitting tied for first in the AL Central and making me look bad while doing it, but to have so many of their players poised to starting the All-Star Game is frankly ridiculous. You could make legitimate cases for Perez, Escobar and Cain but it is hard to justify Hosmer over Miguel Cabrera (or maybe not? ), you certainly can't defend Moustakas over Josh Donaldson or Morales over Nelson Cruz. And Infante (with a negative WAR) or Rios (having only played 14 games) should be nowhere near an All-Star Game. Of course, we are still over a month from the All-Star Game so it is likely that these numbers could change. The real question could be whether such an undeserved overwhelming showing could potentially push Major League Baseball to lessen the importance of fan voting (don't count on it).